My Review: Ann owns a bakery with her best friend, Susan. It was Susan’s dream, really, and Ann is certain her life of long work hours and empty evenings is all she will ever have. When Tom, a young widower, comes into the bakery to order a birthday cake for his son, Jesse, things change very quickly. Ann isn’t a believer and Tom has turned his back on God and the church since his wife’s tragic death. Ann is the first woman he wants in his life and she feels she’s too plain and boring for such a handsome man. The couple work through several heart gripping situations including Susan being assaulted in the parking outside the bakery. Ann can’t believe Susan’s desire to forgive her attacker but overtime Ann understands what forgiveness is all about. 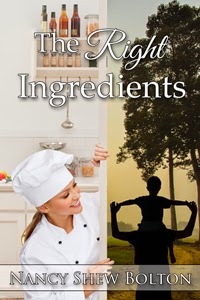 The Right Ingredients is a book about trust. Trust in God, Ann and Tom’s trust that their right for each other, and each one’s individual trust to overcome their past. Tom’s adorable son, Jesse, is the “right ingredient” for this novel bringing a smile to everyone’s face and warming this readers’ heart. Ann’s hectic work responsibilities demand all her time and effort, and what was once a useful, satisfactory life has become a burden to carry. Her bakery partner Susan has lost none of her enthusiasm for their business, and Ann can’t understand her exuberance, or her friend’s Christian faith. So she trudges along, hiding her dissatisfaction from Susan, resigned to a life of work, sleep and problems. Unexpected comments offered by two different people cause a crack in Ann’s armor and her thoughts careen into unexpected directions. Attention from a young widower with a son challenges Ann’s resolve to stay safe and uninvolved. Susan’s example of faith through trial furthers Ann’s curiosity about God. Ann must choose to step toward the unfamiliar freedom of giving and receiving love, or stay in the shadows, stuck in the grip of past hurts. Eleven five star reviews can't be wrong! Purchase The Right Ingredients on Amazon. Sounds like a good book. It is now on my TBR list. Congratulations! This sounds like an interesting and inspirational read. I love the title. THE RIGHT INGREDIENT sounds perfect in so many ways!